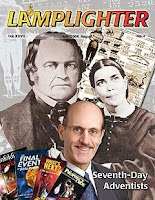  SDA leader Ellen G. White alone possessed the “Spirit of Prophecy” which enabled her to make authoritative pronouncements, especially regarding matters not directly addressed in the Bible. The “investigative judgment” and partial atonement: In 1844 Christ entered the inner sanctum of the heavenly sanctuary to begin the second phase of his intercessory work there. He is judging whether or not those who have professed faith in Him are genuinely saved or not. The SDA does not believe in the doctrine of eternal security; though saved by grace, the believer is kept by the Law. “A Christian who through faith in Jesus Christ has faithfully kept the law’s requirements will be acquitted; there is no condemnation, for the law finds no fault in him. If, on the other hand, it is found that one has broken even a single precept, and this transgression is unconfessed, he will be dealt with just as if he had broken all ten” (Drama of the Ages, p. 351). Soul sleep: upon death, the soul is unconscious until it is reunited with the body when the latter is resurrected. “... In the last days the Sabbath test will be made plain. When this time comes anyone who does not keep the Sabbath will receive the mark of the beast and will be kept from heaven” (Ellen G. White in The Great Controversy, p. 449). The gift of prophecy was a temporary gift (1 Corinthians 13:8-10), and ceased when the canon of Scripture was completed with the book of Revelation. The believer is eternally secure (John 3:16, 6:37, 10:28-29; Philippians 1:6; Hebrews 1:3 and 10:12; Colossians 2:13). All of the believer’s sin, whether past, present, and future, is forgiven at the moment of salvation. The SDA doctrine of “investigative judgment” is therefore wrong. After physical death, the soul lives on in conscious existence. The soul of the believer is in conscious bliss immediately following death (Luke 16:22; 23:43; 2 Corinthians 5:8, and Philippians 1:23). The soul of the unbeliever is in conscious torment (Luke 16:22-23; Hebrews 9:27). The soul of a believer or of an unbeliever is immortal. The believer is free from the Old Testament law (Acts 15:24, Romans 6:14, 7:4-6, 10:4, Galatians 3:24-25; Colossians 2:14). Christ fulfilled the Law on our behalf (Matthew 5:17-18). The believer is under the law of Christ or the “law of God” (Romans 7:251 Corinthians 9:21; Galatians 6:2). Nine of the Ten Commandments are repeated in the New Testament and are binding on the believer. Observance of the Sabbath, the fourth commandment, is not binding on the believer (Romans 14:5, Galatians 4:9-11; Colossians 2:16). The early church met on Sundays, the first day of the week, and not on Saturdays (Acts 20:7 and 1 Corinthians 16:2). There is a continuing controversy over whether SDA is a cult or not. Seventh-Day Adventism: Orthodox or Cult? I am astoundingly surprised how your pastors in the baptist church (one globally popular church) can inaccurately interprete the Bible (Acts 20:7) out of context!! This one wrong interpretation throws out the rest of your good persuasive arguments. You are wrong! Please read that text again (Acts 20:7) I am very certain that your other arguments were also wrong so I dont need to revisit them. Mr. Bmisifea, Use other version of the bible so that you can CLEARLY understand what is Acts 20:7 is all about . Search the truth about the SDA church and how they uplift EG.White as one of the prophet... John is the last prophet according to the scripture ..
the question Mr. Jerico Tiu is.... where did you find the doctrine of "once saved always saved?".... can you prove it? there's a true sabbath , sabbath which equivalent of saturday has been abolish Mr. Bmisifea.